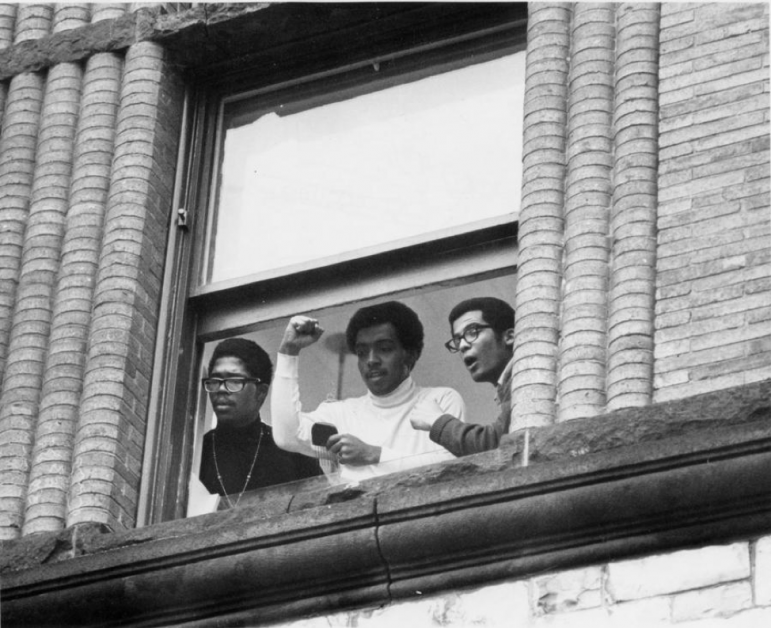 Fifty years ago, (left to right) Richard Jefferson ’70, Preston Washington ’70, Michael Douglass ’71 and 31 other students from the Afro-American Society occupied Hopkins Hall, prompting the creation of the Africana studies program. PHOTO COURTESY OF COLLEGE ARCHIVES. From April 4–7, the Africana studies department celebrated and commemorated 50 years of Africana studies at the College, collectively remembering the individuals and movements that shaped and continue to shape the lives of Black students on campus today. Throughout the weekend, alums, community members and former faculty were invited back to campus to take part in a sequence of events that current students could attend as well. In March 1969, the Afro-American Society (AAS), which is now the Black Student Union (BSU), published a list of 15 demands that included establishing an Afro-American studies program, hiring additional Black faculty and creating a Black cultural center in which Black students could live. A month later, dissatisfied with the administration’s response to their demands, 34 students from the Afro-American Society occupied Hopkins Hall at 4 a.m. on Friday, April 5. The students remained there until the following Tuesday, when opposing parties reached an accord that detailed the tangible steps to be taken by the administration to meet students’ demands. The occupation was a culmination of many nationwide tensions and movements, compounded by frustrations felt by many Black students at the College due to the lack of administrative support for their demands. Not only did it follow the decades-long struggles of the civil rights movements and the assassination of Martin Luther King Jr., but the occupation took place during a wave of student activism at peer institutions. Just a year prior to the occupation, San Francisco State established the department of Black studies following the longest campuswide strike in U.S. history, which lasted for five months. Additionally, two months before the Hopkins occupation, Black students at Wesleyan took over Fisk Hall to prompt the establishment of African American studies as a department, not a program. The importance and significance of celebrating 50 years of Africana studies was echoed by alums who returned to campus for the anniversary. “At my high school, this guy who I used to play basketball with, comes and says to me that ‘the great grandson of Jay Gould, one of the robber barons of America, said that African American people, people of African descent are inferior because they have no culture, no history, no civilization.’ I asked, ‘What did the teacher say?’ My friend said, ‘The teacher fumbled.’ Since then, I started doing research, but I had nobody to guide me. This was in 1968 during the civil rights movement,” said Vernon Manley ’72, one of the 34 occupants of Hopkins Hall, on why an Africana studies program was not only important, but necessary. The remembrance of 50 years of Africana studies is a dual mission. Associate Professor of Africana Studies Rhon Manigault-Bryant, curator of the “For Such A Time As This” exhibition at Special Collections and organizer of the weekend, explained how Africana 50 was both a celebration and a commemoration. “It is not a small feat – it really isn’t. It is a tremendous thing to have been around for half a century,” Manigault-Bryant said. “But there’s also a commemoration aspect because that road has not been easy. There are literally people who fought tooth and nail with this institution, to try and make sure that there’s room for me and my colleagues to do the work that we do. Manigault-Bryant also spoke of the high turnout among alumns at the events. With approximately 70 alums, as well as their guests, participating in the events that took place over the weekend, the discussions and the stories encompassed a variety of lived experiences. One of the events that took place over the weekend was a symposium of three consecutive panels with former and current students, faculty and community members who reflected on their time at the College and beyond. Panelists included Bobette Reed Kahn ’73, who was the first Black woman to graduate from the College, Khalil Abdullah ’72 and Professor of English D.L. Smith. Robin Powell Mandjes ’82, one of the panelists at the symposium, also shared similar sentiments about the weekend. The celebration also included walking tours. “Not A Onetime Event: Echoes of the Hopkins Occupation” was organized by public humanities fellows and drew on the history of student activism to emphasize the existence of unmet demands and the tactics used by the College to stall and repress student demands. BSU also organized a town hall on saturday, which strived to look forward and engage alumni in tackling unmet demands. Rocky Douglas ’19, one of the co-chairs of the BSU, and Shane Beard ’20, MinCo representative and community outreach coordinator, commented on some of the discussions from the town hall meeting. “I sincerely hope that in the next 50 years there will be more support for departments like Africana, that there is an Asian American studies department, that those are both majors, that there is different representation for ideas like Indigenous studies, in our curriculum,” Beard said. “And that we’re finally ADA compliant, and that we are actually respecting and prioritizing the safety of survivors on campus. There are so many different things that people have been fighting for a while, that we’re still not there yet,” Douglas added. Additionally, the BSU Town Hall centered around the need for affinity housing – which was one of the 15 demands of 1969 (“A case for affinity housing: Why the College should reconsider the housing system” by Alia Richardson ’19, Nov 14 2018) – and the conversations around free speech on campus that could inflict violence against marginalized people. “This would be different if it was just intellectual. But this is about our livelihoods, this is 24/7. I have to eat lunch in the same place as these people, and go to class with these people, and sleep in the same space as these people,” Douglas said on the inconsistency between the celebration of the Hopkins occupation, while validating the ideas and dangers that could come with allowing speakers that denounce the humanity of marginalized identities. Similar sentiments were shared by alums as well. Julien, former assistant dean of the college and director of the Institute of Advanced Study and Professor of Comparative Literature, French and Italian and African Studies at Indiana University commented, “We want benchmarks, but we really want also a change in disposition … we need to create the terms of our community, the terms within which we interact with one another. Students and professors also expressed their wishes for the future. “Because I believe in the idea of freedom dreams and we have to dream of the impossible to get anywhere closer to where we want to be, my dream is that in the next 50 years, Williams is a campus where people don’t have to go to drastic means such as an occupation, or releasing demands, or a die-in, or a hunger strike, or two professors taking leave, to make social change,” Douglas said. “Thinking about the future, thinking about 50 years from now, would be that Williams could be a place, and would be a place, and will be a place where folks of African descent, in particular but not exclusively, feel like Williams is really a place for them, feel like it’s a place where they can learn all kinds of things, including and especially about themselves, and how to navigate their existence in the world. I want Williams to be a space that can equip people to feel that way, think that way and create that way and contribute in that way,” Manigault-Bryant said. Editor’s note: This article was updated at 4 p.m. on April 10 to add context to a quote from Todd Hall ’16 and at 3:47 p.m. on April 11 to add the names of the men pictured in the photo: Richard Jefferson ’70, Preston Washington ’70 and Michael Douglass ’71.